Dental work is very expensive. Keeping that smile pretty can be daunting if you don't have dental insurance. Besides good oral hygiene like brushing and flossing regularly, many women are at a loss when it comes to affording dental care and check-ups. And for good reason. Unlike medical, there are few programs to meet the needs of the working poor. One possibility is to get in touch with your local community college. If they offer a dental hygenist program they often are happy to get you in there to clean your teeth. The cost is minimal and you serve as practice for the student. Here are some other resources you might want to check out. 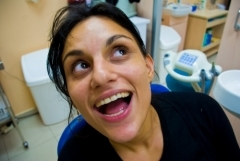 CLINICS - Dental clinics are not free but they do provide services at a reduced rate. Most larger cities in every state have several clinics to choose from. Here are a couple of places you can look.